Local players continue to chip away at their regional competitors’ market share. Middle Tennessee’s locally based banks posted continued gains in market share in the past year, while regional and national banks have lost ground, according to new data released today by the Federal Deposit Insurance Corp.
And while these numbers are just a snapshot from the end of June, they help illustrate the competitive landscape in Nashville’s white-hot banking industry. Pinnacle Financial Partners, Nashville’s largest local lender, is now solidly in third place for local deposits, after narrowly beating regional competitor SunTrust Bank last year following Pinnacle’s $202 million acquisition Avenue Financial. Nashville-based InsBank made one of the larger jumps on the annual ranking, moving up to the 23rd spot with nearly $328 million deposits, up from the 30th spot last year. Since the annual report only looks to the end of June, it does not reflect the region’s recent flurry of M&A activity, with several deals closing in recent months. For instance, Reliant Bank’s $59 million purchase of Columbia-based Community First Bank & Trust was announced in September. Once completed, the deal will give Reliant $1.3 billion in local deposits, up from its reported $840 million in deposits. As seen in last year’s market share report, Bank of America’s dominance as Nashville’s biggest lender continues slip slightly. The Charlotte-based giant has $8.9 billion in local deposits, up from last year’s $8.4 billion, but the bank’s market share dropped by 0.5 percentage points, to 15.6 percent. This shows that while there is more money locally, Bank of America is not the only one benefiting from the extra cash. Despite growth from nearly all local lenders, the fight for deposits in the Nashville markets is real, with several of the city’s lenders searching for solid, low-interest deposits rather than costly brokered deposits. Banks need solid deposits in order to finance their loan growth, which industry insiders say is difficult to master in a fast-growing market like Nashville. 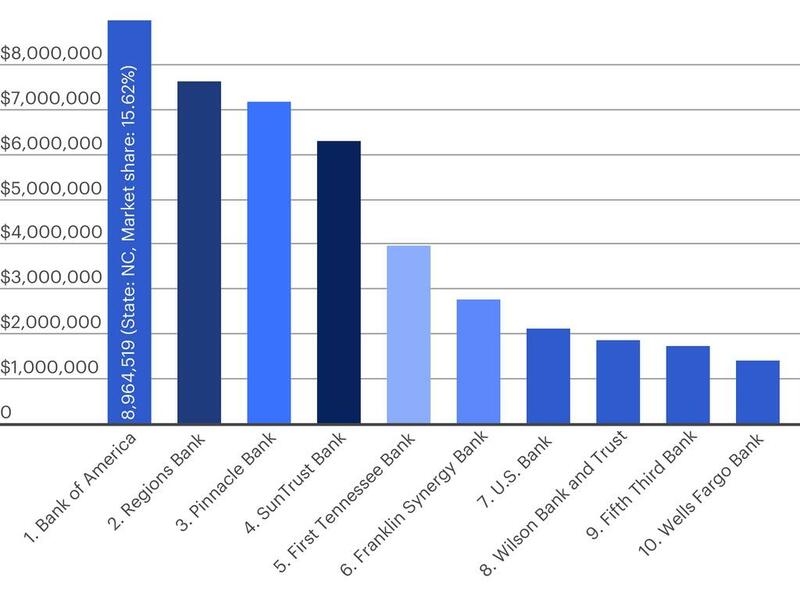 Check out the chart below to see the region’s ten largest lenders by deposits, and take a look at the slideshow with this story to see the dozen biggest locally based banks.